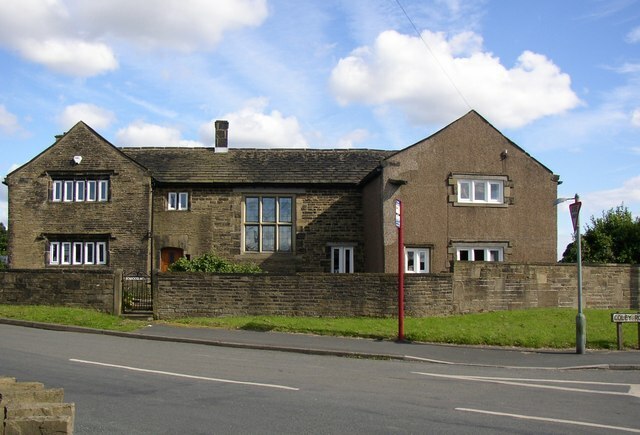 Constructed in 1631 by the prosperous Whitley family of Northowram, Sowood House in Coley is an imposing edifice typical of many buildings erected in the region during the Seventeenth Century. By 1968, the house had fallen into a dilapidated condition and its new owner, Mr. Frank Drury, set about renovating it. During this process, workmen stumbled across a mysterious iron box concealed in the brickwork behind a chimney. Upon opening it, they made the macabre discovery of a human skull, prompting an investigation by the West Yorkshire Police to ensure that it was not evidence of a recent murder. Forensic examination of the skull, however, revealed that it dated to the Seventeenth Century and was probably placed in the chimney when the house was built, as “protection against witches”. That period saw an effusion of such superstitious beliefs and countless objects have been discovered in buildings of the time, bricked up in threshold locations such as chimneys or roofs for talismanic purposes, including shoes, horse skulls and witch bottles. Mummified cats were particularly popular in the Calderdale area, with instances recorded at Slead Hall in Brighouse and the now demolished Mitre Hotel in Halifax. Human remains are much rarer and more significant. This was confirmed by a letter published in the Evening Courier on 5th September 1968 from an eighty year old Southowram woman: “I remember my mother telling me about the skull over seventy years ago. She said the skull was found in an iron box in the chimney breast. It was taken to Coley and buried in the churchyard. Afterwards the house began to be haunted by cries of ‘Where is my head? !’ When, on the advice of the vicar, it was replaced in the chimney the cries ceased. My great-grandfather was a churchwarden of St. John’s, Coley and was present when the skull was put back”. This places the Sowood House skull in that class of relics known as “guardian skulls” or more luridly, “screaming skulls”. In all cases, their legend is the same. The skull protects the house and family from malign influences and preserves their prosperity, as long as it is treated with due respect. But if it is slighted in any way, or removed from the house, misfortune and paranormal activity invariably ensue. The supernatural aspect typically manifests as uncanny auditory disturbances, hence the term “screaming skull”. Such troubles always persist until the skull is returned to its rightful position in the house. There are several famous examples of guardian skulls throughout the country, including those at Calgarth Hall in Cumbria, Burton Agnes Hall in East Yorkshire, Tunstead Farm in Derbyshire and Wardley Hall in Lancashire. The Sowood House skull has been overlooked until recently and whilst it lacks the developed legend of other examples, it is rendered interesting due to the wider usage of images of the human head for apotropaic purposes in Calderdale during the Seventeenth Century, such as the archaic stone head at Coley Hall nearby. Sadly there is no record of what became of the skull following the police investigation of 1968. For more information on the Sowood House skull, please refer to my extended article in Northern Earth Magazine, Issue 124 available here.